HAWAII — December 5, 2018 — During the second day of the annual Snapdragon Technology Summit, Qualcomm Technologies, Inc., a subsidiary of Qualcomm Incorporated (NASDAQ:QCOM), unveiled the newest generation in the 8 Mobile Platform Series, the Qualcomm Snapdragon 855 Mobile Platform. This is the world’s first commercial mobile platform supporting multi-gigabit 5G, industry-leading AI and immersive extended reality (XR) collectively, ushering in a new decade of revolutionary mobile devices. Using new chip architectures built on leading 7nm process technology, Snapdragon 855 will offer users longlasting battery life and superior experiences in areas such as imaging, audio, gaming and XR. Connectivity: The Snapdragon 855 Mobile Platform unleashes transformative 5G experiences to the world, with the Snapdragon X50 5G modem, while harnessing the best in multi-gigabit 4G connectivity with the built in Snapdragon X24 LTE modem. With Snapdragon X50 this platform supports 5G for both Sub-6 GHz and mmWave frequency bands, providing blazing-fast responsiveness and unprecedented speeds. It is designed to deliver multi-gigabit speeds that were previously unachievable in mobile communication. In mmWave frequency bands, users can expect up to 20x faster average performance compared to some of the current commercial solutions, to master the extreme data demands of today and pave the way for next-generation immersive experiences, including multiplayer VR gaming, shopping with AR, and real-time video collaboration. 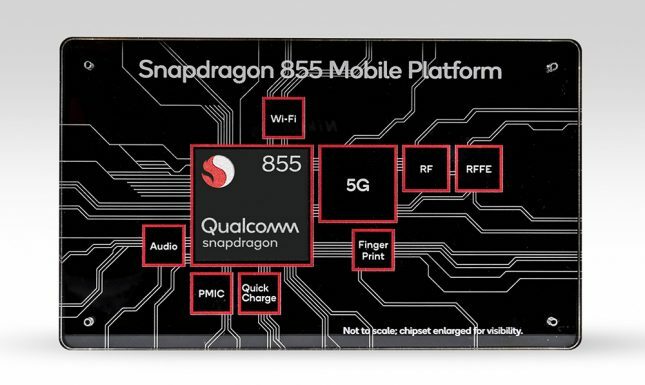 Snapdragon 855 also offers powerful next generation Wi-Fi performance via the Qualcomm Wi-Fi 6-ready mobile platform, including advanced features like 8×8 sounding to serve more devices more efficiently (up to 2x improvement over 4×4 sounding devices), Target Wakeup Time for up to 67% better power efficiency, and the latest security with WPA3. 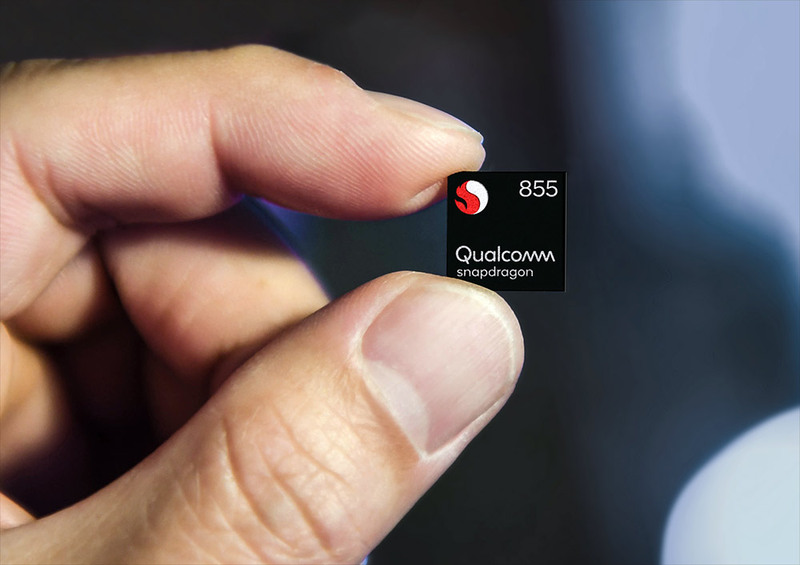 Snapdragon 855 also supports mmWave Wi-Fi, utilizing the Qualcomm® 60 GHz Wi-Fi mobile platform. This industry first 802.11ay-based platform takes Wi-Fi speeds up to an unprecedented 10 Gbps and brings wire-equivalent low latency. Snapdragon 855 also enhances its support for Qualcomm TrueWireless™ Stereo Plus technology to meet growing demands in the headset and hearables markets for truly wireless devices by optimizing for low latency between left and right earbuds as well as lowering the power consumption allowing longer listening time per battery charge. Performance: Snapdragon 855 is engineered to deliver industry leading performance and efficiency. It features our cutting-edge Qualcomm Kryo 485 CPU built on Arm Cortex Technology, offering up to a 45% performance improvement over our previous generation flagship platform. The new Qualcomm Adreno 640 GPU provides up to 20% faster graphics than the previous generation while continuing to lead the industry in performance per watt. Gaming experiences using Adreno graphics will achieve a new level of realism with support of Vulkan 1.1, high dynamic range (HDR), and physically based rendering (PBR). AI: Snapdragon 855 features the 4th generation multi-core Qualcomm AI Engine, which offers a total capacity of more than 7 trillion operations per second (7 TOPs), and 3x the AI performance compared to the previous generation mobile platform. The all new Qualcomm Hexagon 690 Processor includes a newly designed Hexagon Tensor Accelerator (HTA) and four Hexagon Vector eXtensions (HVX) – a doubling of vector processing from our previous generation flagship, plus four scalar threads, all of which provide a powerful blend of dedicated and programmable AI acceleration. Adreno GPU hardware enhancements that improve AI acceleration include 50% more arithmetic logic units, and new instructions to further accelerate AI performance have been added to the all-new Kryo 485 CPU. The 4th gen Qualcomm AI Engine software suite brings a number of enhancements to the Qualcomm Neural Processing SDK, Google’s Android NN-API, and to both Hexagon NN and the Qualcomm Math Library. And a broader range of optimized network precisions and neural network classes are now available to support the surge of on-device AI voice, camera, gaming and XR user experiences, many of which are available from Qualcomm Technologies’ AI software collaborators and will be featured on next-generation Snapdragon 855 devices. The expanding roster of AI software collaborators taking advantage of 4th Gen Qualcomm AI Engine capabilities now includes AI Speech, AnyVision, iFlytek, Elevoc and Nalbi. In addition, Snapdragon 855 brings a more advanced on-device Voice Assistant using dedicated AI acceleration for echo cancellation and noise suppression, so users can talk to their Voice Assistant device at any time. Camera: Snapdragon 855 sets new standards for capturing stunning photos and videos. The new Qualcomm Spectra™ 380 ISP integrates numerous hardware accelerated computer vision (CV) capabilities, enabling the world’s first announced CV-ISP to provide cutting-edge computational photography and video capture features while at the same time offering up to 4x power savings. The CV-ISP includes hardware-based depth sensing which enables video capture, object classification, and object segmentation all in real-time in 4K HDR at 60fps. This means a user can capture a video and accurately replace selected objects or backgrounds in the scene in realtime all with 4K HDR resolution using over 1 billion shades of color. Even further, the new Qualcomm Spectra 380 ISP is the first announced ISP to support video recording using HDR10+, so the more than 1 billion shades of color can be captured with exceptional contrast and visual brilliance. Finally, in order to efficiently store this amazing content, Snapdragon 855 adds hardware acceleration for HEIF file format encoding, reducing file sizes by 50% for efficiently saving and sending user generated content. Gaming: Snapdragon 855 is the first platform to offer our new Snapdragon Elite Gaming experience. This experience includes cinematic color grading in true HDR (>1 billion colors), filmic tone-mapping, demanding physically based rendering (PBR), and support for the Vulkan 1.1 graphics library. Even the most demanding games will run smoother with the Snapdragon 855, with custom algorithms designed to reduce dropped frames by >90%. Multiplayer gaming is improved by reducing latencies, and the Snapdragon 855 platform lowers latency for users choosing the industry’s first 5G, the industry’s first 11ay-based 60GHz Wi-Fi, or simply algorithmic enhancements to reduce latencies using existing 802.11 standards. Finally, the audio experience has been upgraded with the new Qualcomm aptX Adaptive audio codec and support for Qualcomm TrueWireless Stereo Plus. aptX adaptive is designed to provide the ultimate wireless listening experience by combining robust premium audio quality with significantly lower latency for gaming and multimedia applications. XR: Snapdragon 855 also enables volumetric virtual reality (VR) immersive video experience at 8K resolutions at 120fps. This in addition to many of the new capabilities already described gives users the ultimate freedom to watch, learn, play and share dynamic experiences in real time, even further blurring the visual lines between physical and virtual worlds. The Snapdragon 855 is the first mobile platform to support the new Qualcomm 3D Sonic Sensor, the world’s first commercial ultrasonic fingerprint solution supported under the display. This is the only mobile solution that can accurately detect fingerprints through numerous contaminants. Furthermore, this technology enables sleek, cutting-edge form factors while distinguishing itself from alternatives with higher levels of security and accuracy. The Snapdragon 855 Mobile Platform is currently sampling to customers and is expected to begin shipping in commercial devices in 1H 2019. Snapdragon 855 will power the next generation of premium flagship devices and launch the world into a new decade of more immersive and connected user experiences. For more information please visit Qualcomm’s site at www.qualcomm.com/snapdragon.